The Samsung J111FD Galaxy J1 Ace Dual SIM smartphone with its good looks and smart features will instantly grab your attention, make you want to hold it in your palm, and explore it. The black phone contains a uniquely designed smooth, rounded frame and transparent, glass like edges that give it a striking personality and at the same time makes it comfortable to hold. Enjoy detailed clarity with 480 x 800 pixels resolutions on the phone's 4.3inch Super AMOLED touchscreen. The superb Marvell PXA1908 processor embedded in this device gives its best to make the performance of the phone reach top levels without any slow downs. The Android v4.4 KitKat OS of the phone offers a beautiful layout and interactive features that make your user experience outstanding. The phone can be used with two SIMs cards simultaneously and for different purposes. Store all your multimedia files easily with the 8GB storage capacity that can be extended up to 64GB, so you can be surrounded with everything you love in just one phone. Connect to the Internet quickly with 4G LTE network and WiFi support anywhere, anytime. With the Bluetooth v4.0, you can transfer files between two mobiles faster than ever and completely free of wires. To share files between your mobile and the computer quickly, use the micro USB v2.0 port built into the phones black chassis. The Samsung Galaxy J1 Ace features a display that renders 480 x 800 pixels resolutions that bring out the rich details in your pictures, so you can enjoy that movie or game even better. The crisp quality of your high resolution files come out to play on the phone's 4.3inch Super AMOLED display that adds more color and vibrancy to the images. 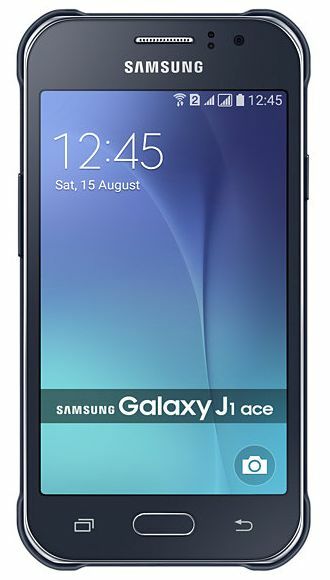 The Samsung Galaxy J1 Ace specs include the incredibly awesome 5MP rear camera that has a f/2.2 aperture. This enables it to capture clear photos even in poor lighting conditions. For those moments, when mere pictures are not enough, use the video recorder with HD 1280 x 720 pixels video recording resolutions that provides you the best in video shooting. Use the Samsung Galaxy J1 Ace camera in the front to freeze your quirky self. This 2MP camera can also be used for video calls. The Samsung Galaxy J1 Ace battery runs for up to 8 hours when used solely for Internet. It gives you about 10 hours of video playback and around 44 hours of audio playback. That’s not all! If the battery is about to die, save it with the Ultra Power Saving Mode that will extend battery life for the important things like calls, messages, and Internet access.